louisgray.com: 2010 Computing: Lighter, Faster, Mobile and Connected. 2010 Computing: Lighter, Faster, Mobile and Connected. The remarkable changes that took place in computing, networking and storage in the last decade finally moved us beyond the battle of megahertz and arguments over Moore's Law, as computers' true speeds are now measured in megabits and gigabits instead. While we continue to need the horsepower to crunch data with PhotoShop, and to run Office, the virtual move to the Web (or Cloud, if you prefer) has realigned our priorities. While I long since gave up desktops, saying I would never buy one again, whatever I get next may not be measured primarily by its processing power or hard disk space, but instead by its form factor and ability to access all my data from anywhere. Amid all the noise and discussion around whatever Apple has planned with the much discussed and never truly seen Tablet (or iSlate... the current moniker being bandied about), my 2007 era MacBook Pro is getting somewhat long in the tooth. Compared to the MacBook Air line, it seems clunky and thick. Compared to today's leading solid state disks, its serial ATA drive is a slowpoke. Compared to netbooks, it looks expensive. Compared to mockup dreams of tablets real or imagined, it looks archaic. 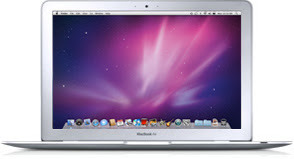 Every couple of days, I head to the Apple Store online and price the MacBook Air. I roll my eyes at the 64 gigabyte solid state disk models, and scrunch my nose at the seemingly low 2 gigabytes of RAM and 128 gigabyte version, while completely ignoring the SATA alternatives, where the S may as well stand for "Slow". I've even looked at Apple's list of refurbished Macs to see if I can pick up the ultralight, thin, machine for just over one grand and make the move. But I haven't. Much of what is stopping me from making the switch lies in our current state of trajectory. Just like I said on Monday when I mentioned you would have to be insane to get a new iPhone now, you would have to be similarly blind to get a new Apple laptop so close to next month's promised event when Cupertino shows its cards, and when Google's Chrome OS is being built for the next decade. As an old hand when it comes to watching Mac rumors, I have learned to ignore the massive amount of noise and predictions about Cupertino. Practically nobody has any insight, even if they all seem to have conjecture. But what we can expect is that the trends that saw advances in the iPhone and introductions like the MacBook Air are going to continue. The Tablet, as well as Apple's next line of MacBooks and MacBook Pros, will be thinner than today's models. The next machines are going to be designed with ever faster connections to wireless networks, and faster hard drives aimed to reduce wait time. And until the day when all our data is stored in the cloud, our hard drives are going to need to be increasingly large, to hold on to all the rich media, from videos to audio, and photos, we are creating and downloading. My 200 GB hard disk, almost 75% consumed, will need to be replaced with a 256 GB solid state disk or larger, and it will happen in a thinner computing device than the one I have now, one that offers faster access to all my Web services, from anywhere. This will be made even easier with expanded access to metropolitan WiFi networks, MiFi cards, and 802.11n WiFi access. The last few years saw an incredible move toward mobile in terms of how we consume the Web, and more recently, how we create content for the Web, best exemplified by the video recording capabilities of the iPod Nano and iPhone 3GS. The next few years will no doubt expand this trend, as more efforts are made by hardware manufacturers and software developers to increase our ability to create and consume all our data from any location. I am waiting for the Tablet, not necessarily to ensure I get my grubby mitts on the first version, as I am still waiting to see how it fits in my electronics ecosystem, alongside the MacBook Pro and iPhone, but to see if this further drives forward the proofpoints of smaller, thinner, mobile and connected. Elements of this Tablet will not only impact Apple's mobile lineup for years to come, but those for the entire industry. And whatever laptop I end up getting, after the Tablet's introduction, it will be impacted by whatever Steve Jobs and team tell as at the end of January. Then, the fun is just getting started, as the Windows minions follow suit in copy/paste central, and Google tries to make inroads to change the game themselves.